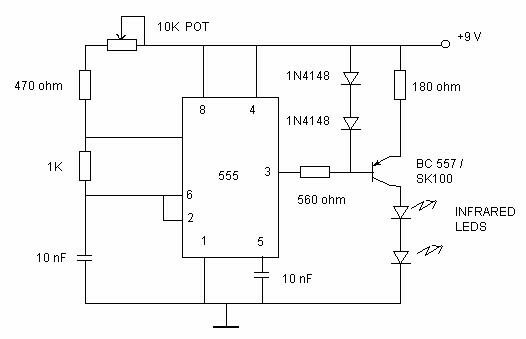 In this circuit, the alarm will be switched on under the following four different conditions: 1. When light falls on LDR1 (at the entry to the premises). 2. When light falling on LDR2 is obstructed. 3. When door switches are opened or a wire is broken. 4. When a handle is touched. 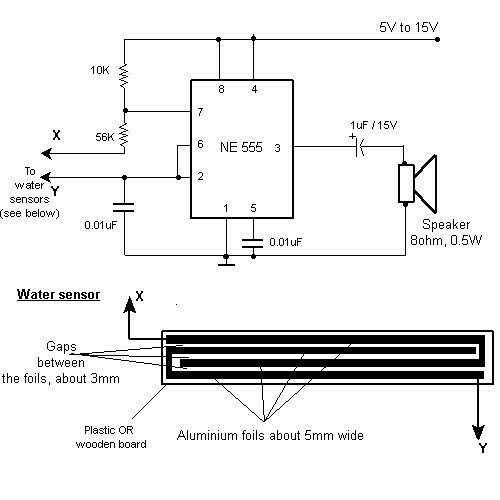 The light dependent resistor LDR1 should be placed in darkness near the door lock or handle etc. 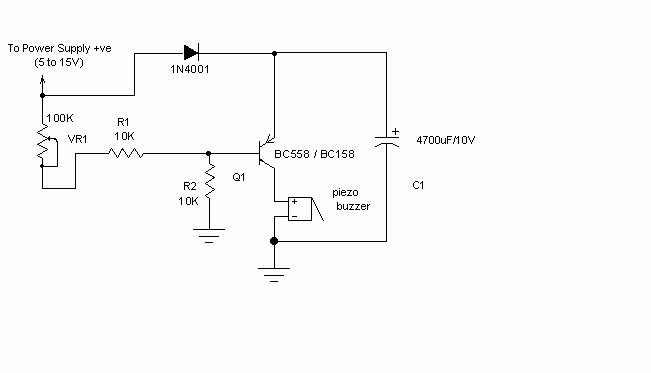 If an intruder flashes his torch, its light will fall on LDR1, reducing the voltage drop across it and so also the voltage applied to trigger 1 (pin 6) of IC1. 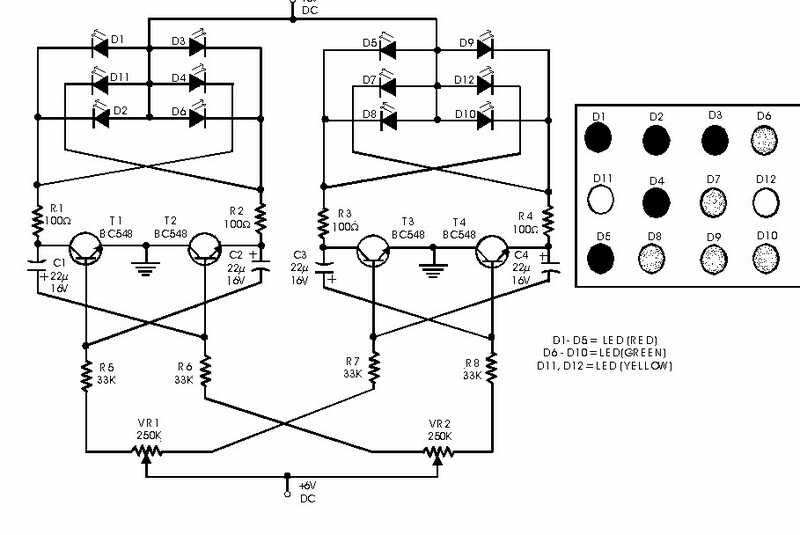 Thus transistor T2 will get forward biased and relay RL1 energise and operate the alarm. Sensitivity of LDR1 can be adjusted by varying preset VR1. LDR2 may be placed on one side of a corridor such that the beam of light from a light source always falls on it. When an intruder passes through the corridor, his shadow falls on LDR2. 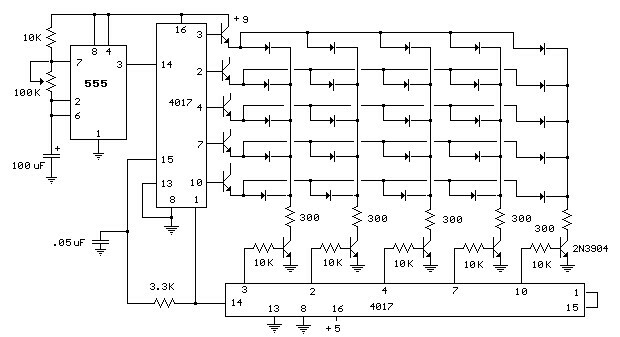 As a result voltage drop across LDR2 increases and pin 8 of IC1 goes low while output pin 9 of IC1 goes high. 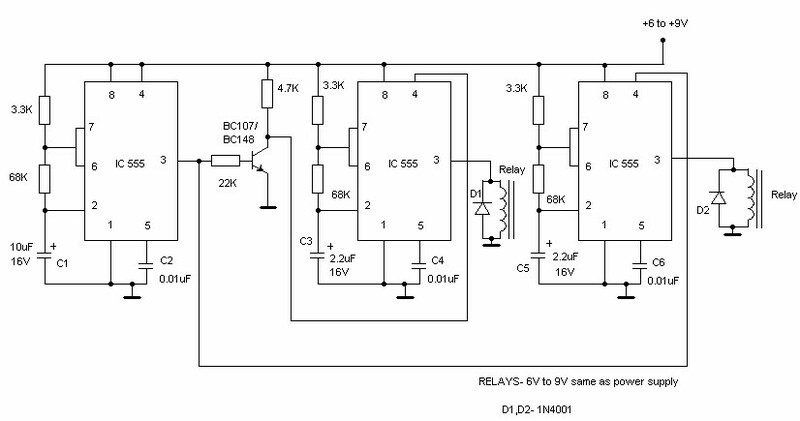 Transistor T2 gets switched on and the relay operates to set the alarm. 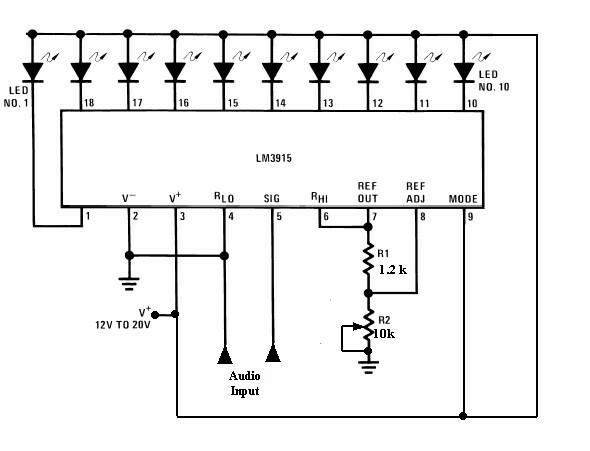 The sensitivity of LDR2 can be adjusted by varying potentiometer VR2. A long but very thin wire may be connected between the points A and B or C and D across a window or a door. This long wire may even be used to lock or tie something. If anyone cuts or breaks this wire, the alarm will be switched on as pin 8 or 6 will go low. In place of the wire between points A and B or C and D door switches can be connected. These switches should be fixed on the door in such a way that when the door is closed the switch gets closed and when the door is open the switch remains open. If the switches or wire, are not used between these points, the points should be shorted. With the help of a wire, connect the touch point (P) with the handle of a door or some other suitable object made of conducting material. 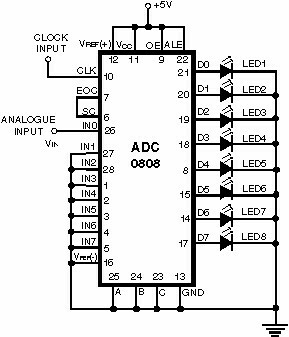 When one touches this handle or the other connected object, pin 6 of IC1 goes ‘low’. So the alarm and the relay gets switched on. Remember that the object connected to this touch point should be well insulated from ground. For good touch action, potentiometer VR3 should be properly adjusted. 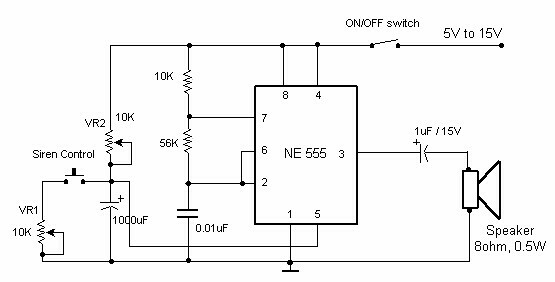 If potentiometer VR3 tapping is held more towards ground, the alarm will get switched on even without touching. In such a situation, the tapping should be raised. But the tapping point should not be raised too much as the touch action would then vanish. When you vary potentiometer VR1, re-adjust the sensitivity of the touch point with the help of potentiometer VR3 properly. 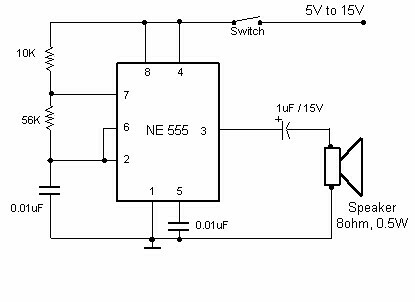 If the alarm has a voltage rating of other than 6V (more than 6V), or if it draws a high current (more than 150 mA), connect it through the relay points as shown by the dotted lines. 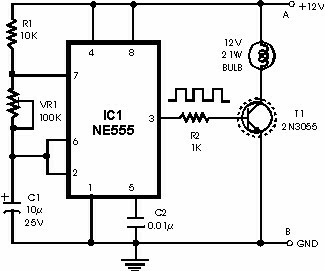 As a burglar alarm, battery backup is necessary for this circuit. Note: Electric sparking in the vicinity of this circuit may cause false triggering of the circuit. 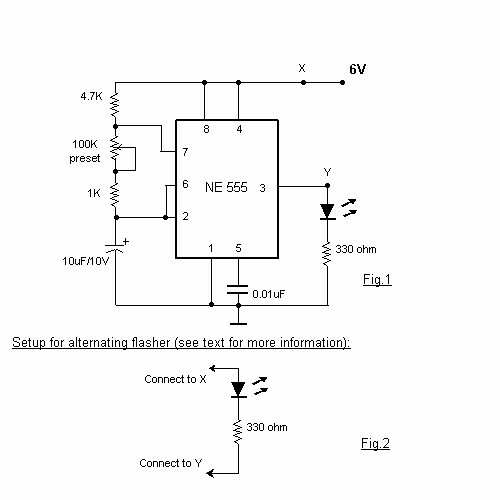 To avoid this adjust potentiometer VR3 properly. This simple device checks if there is water in a pot plant. You stick the two probes(paperclips)into the pot plant and if the LED lights, it means there is water in the pot plant. 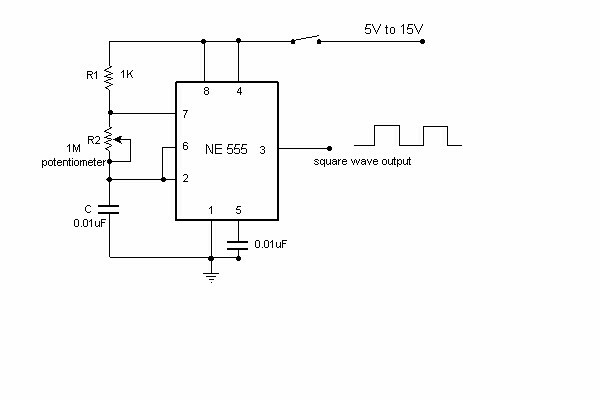 Here is a simple circuit which can be used for decoration purposes or as an indicator. Flashing or dancing speed of LEDs can be adjusted and various dancing patterns of lights can be formed. 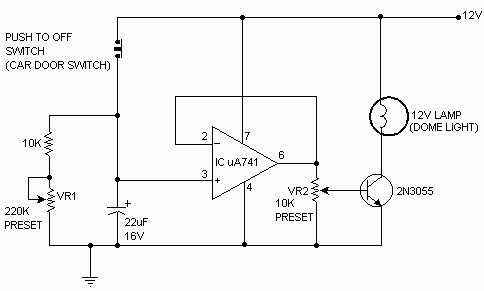 Simple variable frequency oscilator circuit. 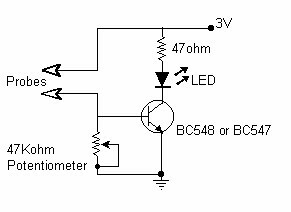 The electronic siren circuit given here is based on a complementary transistor pair consisting of Q2 & Q3 (BC557 & BC 37) wired as an astable multivibrator oscillator,which directly drives the speaker.The transistor Q1 is used to provide a full charge on capacitor C2 when power is turned ON. 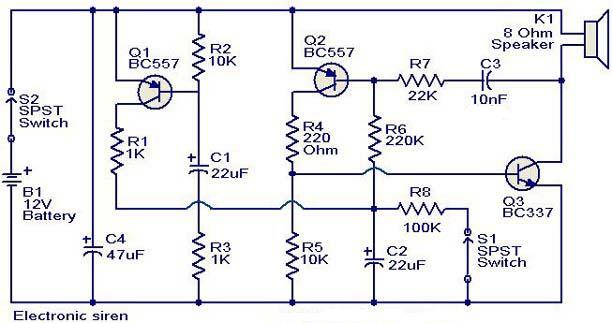 When push button switch S1 is pressed , the capacitor C2 slowly discharges through resistor R8.This makes the circuit to oscillate at a low frequency that increases to a high frequency and kept indefinitely as the capacitor is fully discharged. 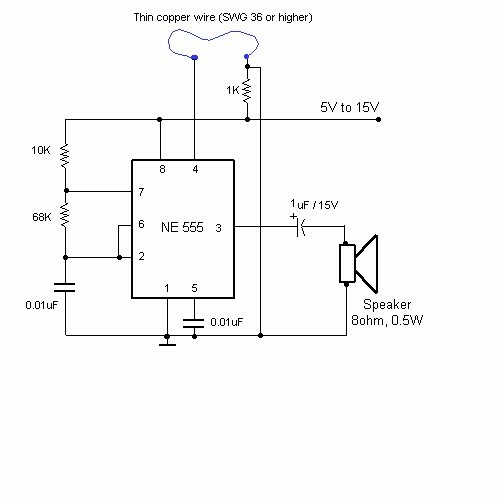 When the switch P1 is released, the output frequency decreases slowly as C2 is charged to the positive voltage through resistance R6 and the Base-Emitter junction of tramsistor Q2. 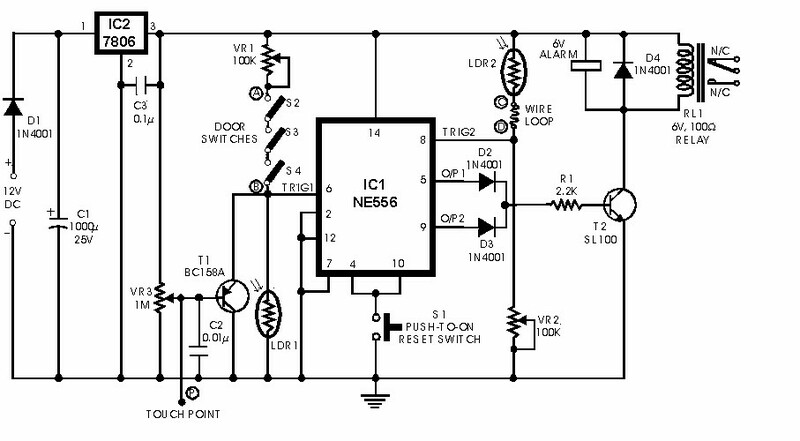 When C2 is fully charged to the positive battery voltage the circuit stops oscillating. 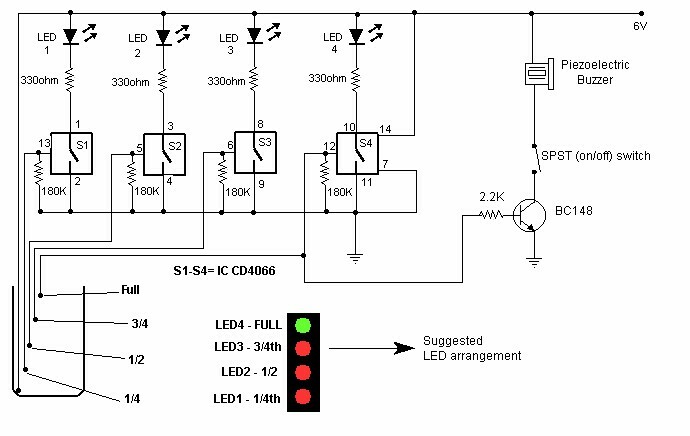 The LED circuit is drawn showing 25 LEDs and 10 transistors (2N3904) but can be expanded up to a 100 by using sucessive stages of the 4017 counters.